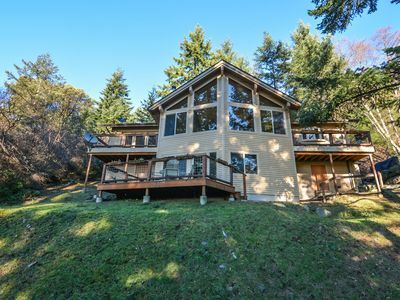 The Quinn Cottage is a lovely waterfront home nestled on a sunny, wooded acre of land looking across Harney Channel to Shaw Island. 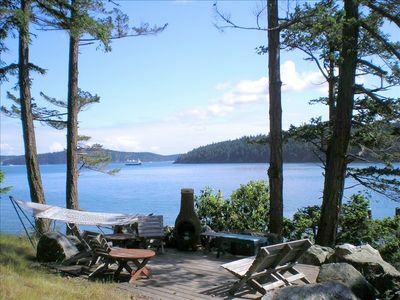 The famous San Juan Island ferries and a continual parade of pleasure boats sail by the cottage’s view throughout the day. The south-facing exposure catches the sunrise and sunset as well as all the sunlight and warmth possible through the seasons. It is a perfect location. 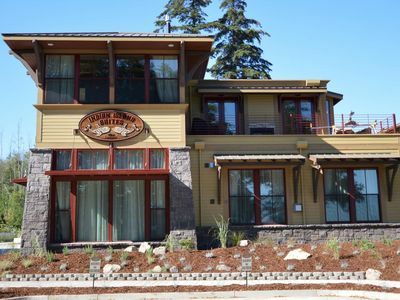 The cottage is just two miles from the Orcas Island ferry landing and public dock and the quaint Orcas Village with a well-stocked country market, shops and eateries, the Victorian era Orcas Hotel and Restaurant, movie rentals, whale watching excursion boats, and kayak rentals. Also two miles from the cottage is Bayhead Marina with boat slips and an easy boat and kayak launch ramp. Lake Killebrew, a small public lake only one mile away, is fun for fishing and exploration. 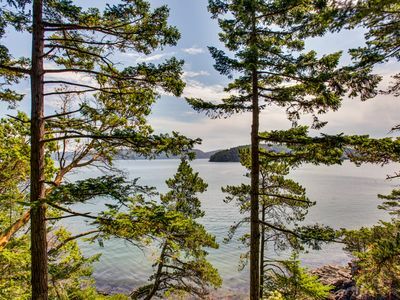 An abundance of wildlife can be enjoyed from this pretty seaside retreat: deer, rabbits, raccoons, otters, mink, seals, bald eagles, heron, and an endless variety of other sea, shore, and land birds. At low tide the rocks at the water’s edge offer hours of exploration for oysters, starfish, crab, small fish, octopus, jelly fish, and other sea creatures. Kayaking from this side of the island is fabulous. Other islands, coves, beaches, and villages are all within easy paddle distances. Rental guests are given information and advice so they can create their exciting kayaking adventures. At night the sound of water lapping against the rocks and beach lulls visitors to sleep. 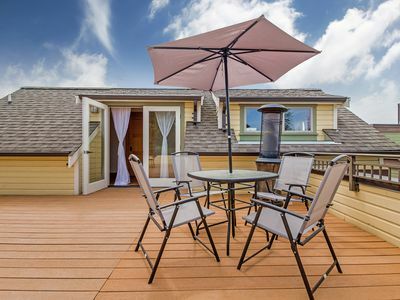 This light, airy, newly remodeled home has an open living room, dining room, and kitchen with vaulted ceilings, skylights, and floor to ceiling windows opening onto a large wrap-around main deck. 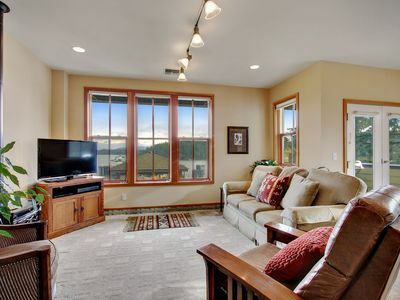 The panoramic view from this 'great room' is stunning. 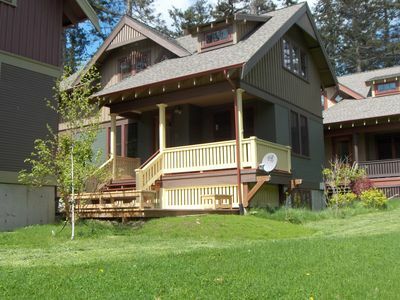 It is also completely furnished with all the details of a cozy family cottage. 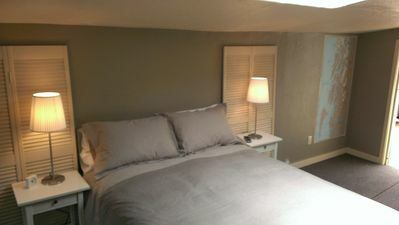 The main level has two bedrooms, both with Queen beds. The main level has a colorful bathroom with shower. The separate lower level is a very large bedroom with a main king bed area, a day bed and sitting niche, and its own bathroom with shower. It is connected to the upper level by exterior stairs and has its own private exterior entry. 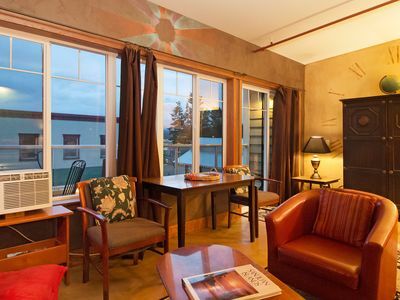 The water view is beautiful from this room's large windows. 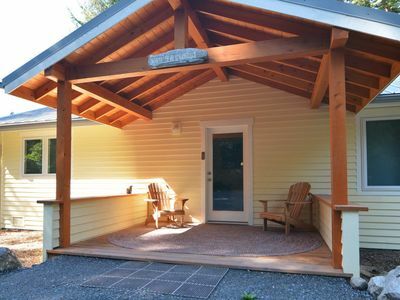 This serene lower level is perfect for a second couple or a children's getaway. It has its own books, games, television with cable and DVD, and plenty of space to relax. All bedrooms have lovely pillows and spreads, cozy comforters, and high quality bedding and linens. 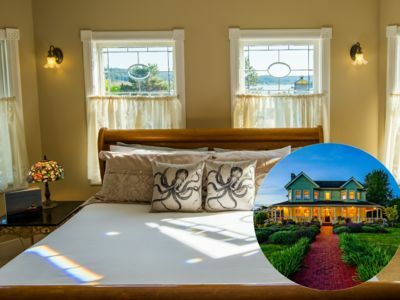 The entire home has many European Bed and Breakfast touches and amenities. Wood is supplied for the charming wood-burning stove in the living room. 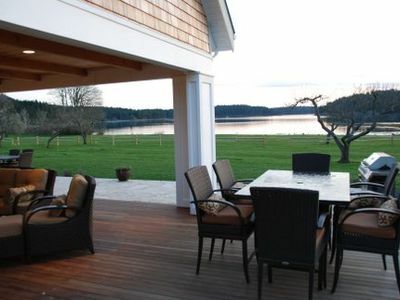 In addition every room in the home has its own baseboard heater and separate thermostat for year-round comfort. The open, sunny kitchen is fully equipped for cooking, dining, and entertaining with lovely dishes, table ware, and linens. Even the gourmet cook will find the necessary appliances, cookware, bake ware, and utensils for any special recipe. The pantry/laundry room has a washer and dryer, cleaning and laundry supplies, picnic ware, beach towels, and ample storage space. Many cooking essentials are available for use by the rental guest, including spices, herbs, coffee, tea, sugar and oils, and much more. The large glassed-in upper deck and the water's edge lower deck have Adirondack chairs, dining tables, both gas and charcoal barbeques, a gas chiminea for 'camp fires,' and a double hammock. 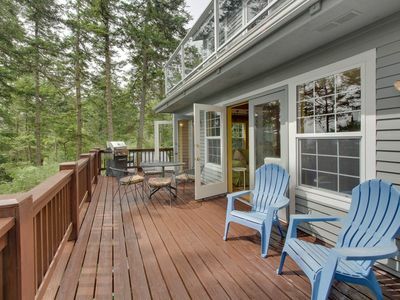 Both decks are lovely spots for reading, relaxing, dining, and the constant viewing of water and wildlife. The landscaped areas around the house have whimsical pieces of “exterior art” and a full herb garden. 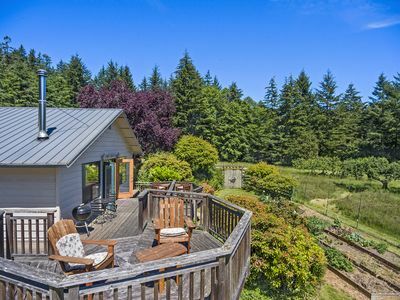 The acre of land beyond the house is covered with mossy knolls and sunny fields, creating a cushion of peace for the cottage. No road noise can be heard from this serene spot. 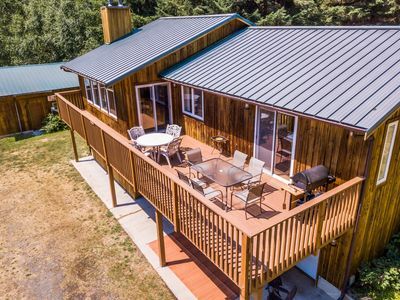 Other amenities of this inviting home include wireless Broadband (high speed) internet, satellite television (Dish Network), puzzles and games, a large library of adult and children’s books and movies, a DVD player, and an Ipod dock. 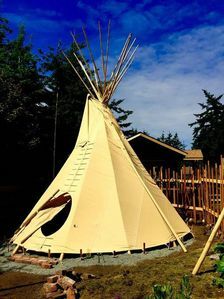 Orcas Island itself offers many adventures, including hiking, sea kayaking, lake and ocean fishing, boating, whale watching, canoeing, shopping, beachcombing, and biking, as well as day trips by ferry to other islands and Victoria, British Columbia. The island has many local fairs and celebrations, open-air music concerts, quality live theatre, flea markets, garage sales, and farmers’ markets. 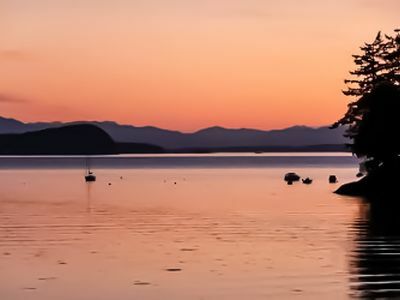 Eastsound, the main village on the island, and a 15 to 20-minute drive from the Quinn Cottage through pastoral farmlands and beautiful mountain vistas, is a charming town with many restaurants, specialty shops, and a major super market. We invite you to visit this special island and stay in our own magic spot, the Quinn Cottage. Please check our website calendar for available dates. We look forward to getting your request by email. Please also feel free to request by email additional photos, Google Map location, as well as more excerpts from the Quinn Cottage guest book. No Smoking, No Pets, Consult with owners about children under 5. Also see our #335603 Quinn Cottage San Diego. 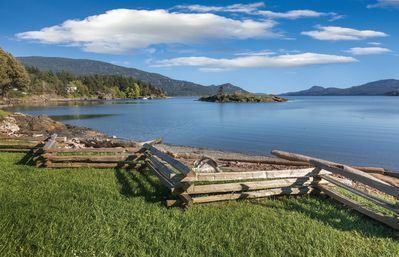 Neil Bay Waterfront Family And Pet Friendly Property! 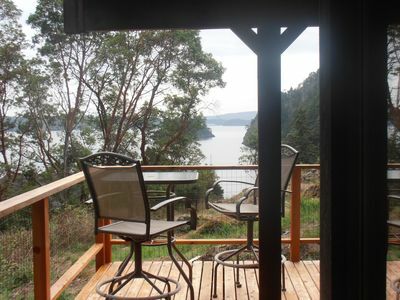 Waterfront Cabin with Great Views Near Lopez Ferry Landing. 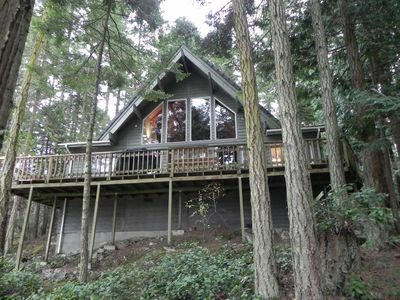 Romantic Honeymoon Cottage with Water Views & Hot Tub. Small Dog Friendly! Only Two Blocks to the Beach, & Only A Short Walk to Town. Brand New Charmer! NEWLY LISTED! HISTORIC FARM! PRIVATE AND LUSH! 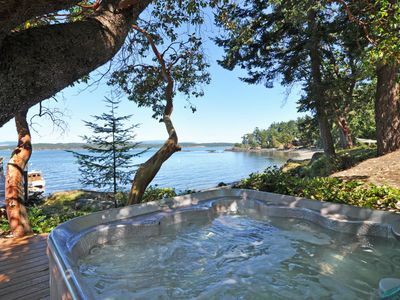 Your own personal outdoor hot tub!